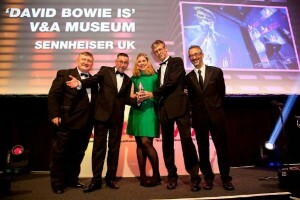 Audio specialist Sennheiser has won the coveted Audio Installation of the year at this year’s AV Awards for its contribution to the audio system for the David Bowie is exhibition at the Victoria and Albert Museum. 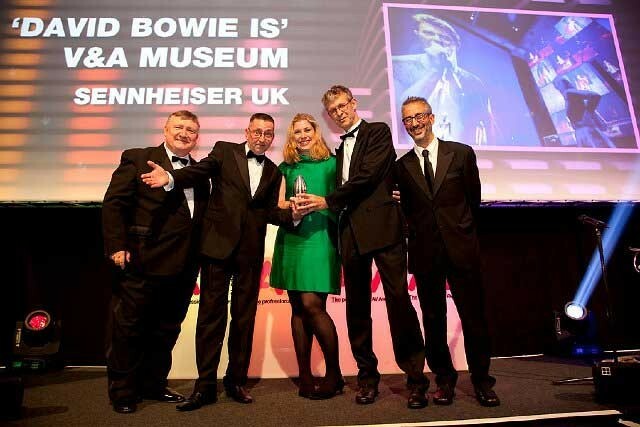 This latest accolade follows hot on the heals of being honoured for Temporary Installation Project of the Year at the inaugural Pro Sound Awards for the V&A’s fastest selling exhibition to date, David Bowie is which ran for five months between March and August this year. The exhibition was one of the museum’s most successful exhibitions with around 312,000 visitors and pre-booked ticket sales reaching more than 67,000 prior to opening. The exhibition was the first international retrospective of the extraordinary career of David Bowie, exploring his creative processes as a musical innovator and cultural icon. The sound experience was integral to the exhibition design and Sennheiser’s guidePORT audio guide system ensured that every visitor could immerse themselves in Bowie’s music, art, and style. The system seamlessly integrated sound material into the tour of the galleries and automatically provided music and narrative when visitors approached the exhibits. The audio voyage culminated in a Sennheiser 3DAudio experience, where visitors were enveloped by a dramatic multi-media performance of David Bowie’s music played through hidden Neumann KH series loudspeakers. "We are very proud to have worked with the V&A on the David Bowie project," says Phil Massey, General Manager at Sennheiser UK. "Being honoured with an AV Award shows that our work is appreciated by the industry which is delightful." Sennheiser continues to support the David Bowie is exhibition as it goes on tour to a number of leading venues of art and design around the world and is currently showing at the Art Gallery of Ontario in Canada until 27 November. It will then travel to Chicago, Brazil, Paris and Amsterdam. Additionally, Business Installation of the year went to turnkey audio visual solutions company Feltech Electronics for the installation at world-renowned construction and agricultural equipment company JCB’s Presentation Theatre, which also features a Sennheiser guidePORT system. “The Presentation Theatre, which can host approximately 250 people and features a revolving stage to show the company’s products, is part of the brand experience at the company’s headquarters in Rocester,” says Sennheiser UK’s chief engineer, Andrew Lillywhite, who worked closely with Feltech throughout the installation. In picture: Clive Caldwell (editor of AV Magazine), Alan March (product manager, Sennheiser UK), Sophie Hargroves (senior corporate partnership manager, Victoria and Albert Museum), Hugo Roche (Sysco MD), David Baddiel (AV Awards host).